The invention relates to a plurality of liquid cleansing compositions having at least one lamellar phase which possesses a lotion-like appearance conveying signals of enhanced moisturization and at least one abutting isotropic phase having enhanced cleansing ability. The inventive composition is contained in a partitionless container in one embodiment conveying signals of a plurality of compositions. This multiphase composition is stable upon storage and is dispensed as a striped product where typically one stripe has primarily a cleansing function and a second stripe has primarily a moisturization function. This application claims the benefit of U.S. provisional application No. 60/190,779, filed Mar. 20, 2000. In accordance with these and other aspects of the invention, the invention will now be described with reference to the accompanying drawing. FIG. 1 is a perspective view showing one embodiment of the present invention where two separate liquid cleansing compositions, one in lamellar phase, and the other in isotropic phase are contained in a partitionless container. Referring to FIG. 1, partitionless container  10 contains two separate liquid cleansing compositions 18 and 20 separated by boundary layer 22. Also depicted in FIG. 1 is pump mechanism 12 having a single outlet 14 and suction tube 16 with a single intake hole 24. Preferably cleansing compositions 18 and 20 are visually distinct signaling duality to the consumer and are in the form of a lamellar phase and an isotropic phase respectively. More preferably cleansing compositions 18 and 20 have different colors or distinctive visual clarity. In another embodiment of the invention, the partitionless container may contain more than two separate liquid cleaning compositions as long as at least one composition is present as a lamellar phase and at least one composition is present as an isotropic phase and there is at least one interface between the two phases. The anionic surfactant (which may comprise 3 to 40% by wt. of total composition) may be, for example, an aliphatic sulfonate, such as a primary alkane (e.g., C 8-C22) sulfonate, primary alkane (e.g., C8-C22) disulfonate, C8-C22 alkene sulfonate, C8-C22 hydroxyalkane sulfonate or alkyl glyceryl ether sulfonate (AGS); or an aromatic sulfonate such as alkyl benzene sulfonate, and the like. The anionic may also be alkyl sulfosuccinates (including mono- and dialkyl, e.g., C 6-C22 sulfosuccinates); alkyl and acyl taurates, alkyl and acyl sarcosinates, sulfoacetates, C8-C22 alkyl phosphates and phosphates, alkyl phosphate esters and alkoxyl alkyl phosphate esters, acyl lactates, C8-C22 monoalkyl succinates and maleates, sulphoacetates, and acyl isethionates, and the like. Sarcosinates are generally indicated by the formula RCON(CH 3)CH2CO2M, wherein R ranges from C8 to C20 alkyl and M is a solubilizing cation. wherein R 2 ranges from C8-C20 alkyl, R3 ranges from C1-C4 alkyl and M is a solubilizing cation. 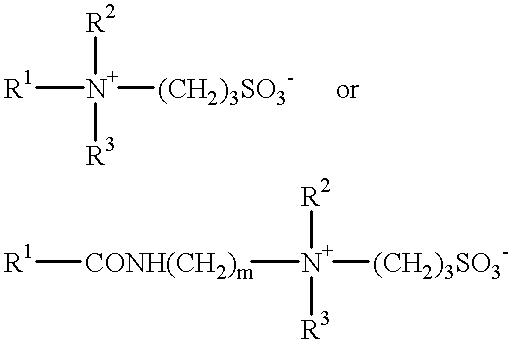 wherein R is C 8 to C20 alkyl; n is 0 to 20; and M is as defined above. Another surfactant which may be used are the C 8-C18 acyl isethionates. These esters are prepared by reaction between alkali metal isethionate with mixed aliphatic fatty acids having from 6 to 18 carbon atoms and an iodine value of less than 20. At least 75% of the mixed fatty acids have from 12 to 18 carbon atoms and up to 25% have from 6 to 10 carbon atoms. wherein R is an alkyl group having 8 to 18 carbons, m is an integer from 1 to 4, X and Y are hydrogen or an alkyl group having 1 to 4 carbons and M + is a monovalent cation such as, for example, sodium, potassium or ammonium. 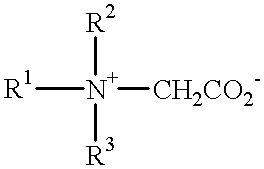 wherein R 2 contains an alkyl, alkenyl, or hydroxy alkyl radical of from about 8 to about 18 carbon atoms, from 0 to about 10 ethylene oxide moieties and from 0 to about 1 glyceryl moiety; Y is selected from the group consisting of nitrogen, phosphorus, and sulfur atoms; R3 is an alkyl or monohydroxyalkyl group containing about 1 to about 3 carbon atoms; X is 1 when Y is a sulfur atom, and 2 when Y is a nitrogen or phosphorus atom; R4 is an alkylene or hydroxyalkylene of from about 1 to about 4 carbon atoms and Z is a radical selected from the group consisting of carboxylate, sulfonate, sulfate, phosphonate, and phosphate groups. In both formulae R 1, R2 and R3 are as defined previously. R1 may in particular be a mixture of C12 and C14 alkyl groups derived from coconut so that at least half, preferably at least three quarters of the groups R1 have 10 to 14 carbon atoms. R2 and R3 are preferably methyl. A suitable betaine is cocoamidopropyl betaine. In these formulae R 1, R2 and R3 are as discussed previously. The nonionic which may be used includes in particular the reaction products of compounds having a hydrophobic group and a reactive hydrogen atom, for example aliphatic alcohols, acids, amides or alkyl phenols with alkylene oxides, especially ethylene oxide either alone or with propylene oxide. Specific nonionic detergent compounds are alkyl (C 6-C22) phenols-ethylene oxide condensates, the condensation products of aliphatic (C8-C18) primary or secondary linear or branched alcohols with ethylene oxide, and products made by condensation of ethylene oxide with the reaction products of propylene oxide and ethylenediamine. Other so-called nonionic detergent compounds include long chain tertiary amine oxides, long chain tertiary phosphine oxides and dialkyl sulphoxides, and the like. wherein R 2 is selected from the group consisting of alkyl, alkylphenyl, hydroxyalkyl, hydroxyalkylphenyl, and mixtures thereof in which alkyl groups contain from about 10 to about 18, preferably from about 12 to about 14, carbon atoms; n is 0 to 3, preferably 2; t is from 0 to about 10, preferably 0; and x is from 1.3 to about 10, preferably from 1.3 to about 2.7. The glycosyl is preferably derived from glucose. To prepare these compounds, the alcohol or alkylpolyethoxy alcohol is formed first and then reacted with glucose, or a source of glucose, to form the glucoside (attachment at the 1-position). The additional glycosyl units can then be attached between their 1-position and the preceding glycosyl units 2-, 3-, 4- and/or 6-position, preferably predominantly the 2-position. Examples of fatty acids which may be used are C 10-C22 acids such as the following: lauric acid, oleic acid, isostearic acid, linoleic acid, linolenic acid, ricinoleic acid, elaidic acid, arichidonic acid, myristoleic acid and palmitoleic acid, and the like. Ester derivatives include propylene glycol isostearate, propylene glycol oleate, glyceryl isostearate, glyceryl oleate and polyglyceryl diisostearate, and the like. Organic solvents, such as ethanol; auxiliary thickeners, sequestering agents, such as tetrasodium ethylenediaminetetraacetate (EDTA), EHDP or mixtures in an amount of 0.01 to 1%, preferably 0.01 to 0.05%; and coloring agents, opacifiers and pearlizers such as zinc stearate, magnesium stearate, TiO 2, EGMS (ethylene glycol monostearate) or Lytron 621 (Styrene/Acrylate copolymer); all of which are useful in enhancing the appearance or cosmetic properties of the product. each of said isotropic phases having a low shear viscosity value above about 15 K cps at 25° C.
2. The composition of claim 1 wherein each of said lamellar phases has a low shear viscosity value not exceeding about 300 K cps at 25° C.; and each of said isotropic phases has a low shear viscosity value not exceeding about 100 K cps at 25° C.
3. The composition of claim 1 wherein the amphoteric surfactant concentration in each phase is in the range of about 2 to 40 weight percent. 4. The composition of claim 1 wherein the anionic surfactant concentration in each phase is in the range of about 3 to 40 weight percent. 5. The composition of claim 1 wherein the nonionic surfactant concentration in each phase is in the range of about 0 to 40 weight percent. 6. The composition of claim 1 wherein the emollient concentration in the lamellar phase is in the range of about 0 to 60 weight percent. 7. The composition of claim 1 wherein the lamellar structurant concentration in the lamellar phase is in the range of about 0.3 to 15 weight percent. 8. The composition of claim 1 wherein the amphoteric or zwitterionic surfactant in each phase is selected from either cocamidopropyl betaine, or an alkali metal salt of alkyl amphoacetate. 9. The composition of claim 1 wherein the anionic surfactant is selected from the group consisting of alkali metal or ammonium alkyl ether sulfate, alkali metal or ammonium alkyl sarcosinate, alkali metal or ammonium alkyl sulfosuccinate, and alkali metal or ammonium alkyl sulfate. 10. The composition of claim 1 wherein mixing of said abutting phases is prevented across the interfacial boundary surfaces of said abutting phases, when said composition is stored for at least 25° C. for 70 days or at least 50° C. for 7 days. 11. The composition of claim 1 wherein the lamellar structurant is selected from the group consisting of lauric acid, isostearic acid, trihydroxystearin, palm kernel acid, capric acid, oleic acid, and caprylic acid. each of said isotropic phases having a low shear viscosity value between 15 and 100 K cps at 25° C.
13. An extrudable multiphase aqueous lamellar structured and isotropic liquid cleansing product contained in a partitionless container. 14. The product of claim 13 wherein the container has a single opening for dispensing a multiphase composition. 15. The product of claim 14 wherein said dispensed composition has at least 1 weight percent of each phase contained within said partitionless container. 16. The product of claim 14 wherein said opening has a single pump attached thereto. 17. The product of claim 13 wherein each phase has a distinct physical appearance. 18. The product of claim 17 wherein each phase has a distinct color. 19. The product of claim 13 wherein there are only two phases.